Part of the reason I have so many games stacked up in my list is that I’ve decided to include a lot more rogue-like titles. My initial instinct long ago was to call the rogue-like genre “done,” because there are only so many variations on the theme. And not all of them are terribly innovative. On the other hand, a few of them manage to add a dimension. 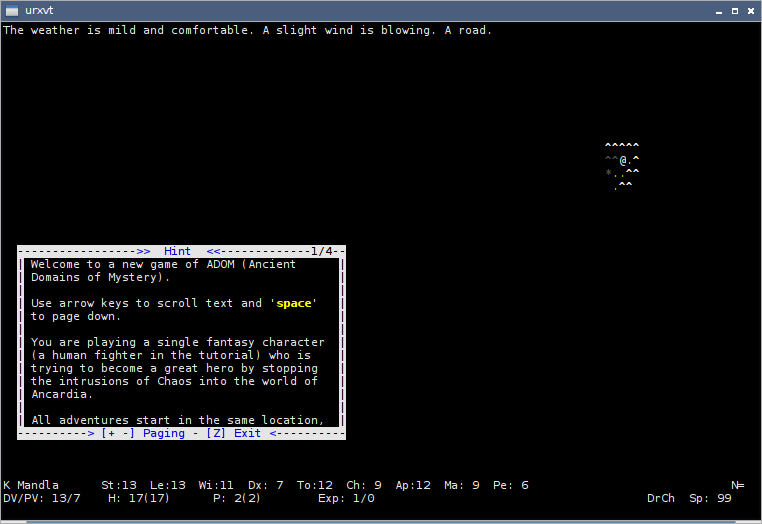 adom does well in adding a lot of the features seen in contemporary role-playing action games. The most obvious and perhaps most important addition is adom’s use of a world map, which doesn’t quite come into play in games like rogue, hack, nethack — or crawl, for that matter. At best, the traditional rogue-like might suggest a few shops on the surface, and maybe some townspeople or merchants. adom has environments and geographic features — as well as towns, villagers and merchants — with excursions into dungeons offering a transition from strategic to tactical maps. It’s very refreshing, if the rogue-like game you’re used to (as I was) mainly works as a one-way down-and-up fetch quest. adom also adds skills and “talents” (what I would probably call “feats”), but in a different way than, for example, how crawl manages them. Gain a level and boost skills and talents of your choice, much like some traditional pen-and-paper RPGs. 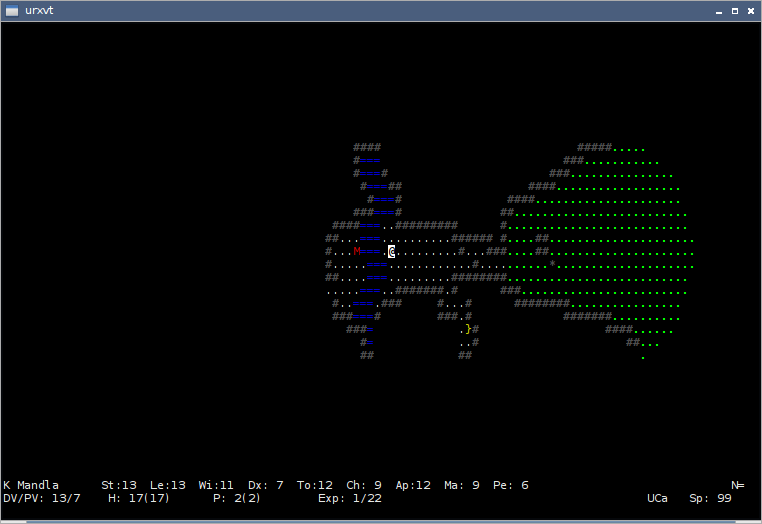 I also like that adom has a very terse set of controls, most of which are either traditional commands (like “o” to open doors or “i” for inventory) or simple mnemonics (“t” for target). Certain keys are reserved for identical functions no matter what map or menu you are using, and some combinations work as repeating instructions. It’s convenient, as opposed to 104 different keys for 104 different commands. That also means it’s fairly quick to learn. To add to that, there’s an onboard tutorial that will step you through a basic quest, and help pages at every juncture. If I read the home pages right, the latest update to adom was in August, which means there’s a active development and a strong community around the game. And given that the earliest copyright of the game is around 1994, it’s a 20-year achievement that doesn’t seem likely to stop. This entry was posted in Linux and tagged game on 2014/10/17 by K.Mandla.